Elizabeth Greenspan is a writer and urban anthropologist, currently affiliated with the School of Design at the University of Pennsylvania. She writes regularly about cities, architecture, and real estate for a number of print and online publications, including Architect Magazine, The New Yorker, Bloomberg Businessweek, The Boston Globe, Pacific Standard, Salon, The Atlantic, and others. Her book, Battle for Ground Zero, about the politics of commerce and commemoration at the World Trade Center site, was published in 2013 by St. Martin’s Press. Liz has appeared on numerous radio and television programs, including NPR’s Here and Now, and On Point, PRI’s The World, WNYC’s Leonard Lopate Show, and CSPAN’s BookTV. She also speaks regularly about cities, architecture, and public space to a range of audiences. 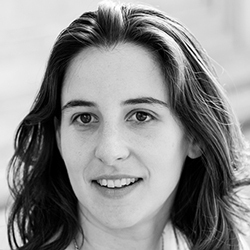 Liz’s research interests include history of architecture, the politics and design of public space, New York City, and urban ethnography. She has taught writing at Harvard University and urban studies at the University of Pennsylvania. She holds a PhD in anthropology and urban studies from the University of Pennsylvania. – Saskia Sassen, Professor of Sociology, Columbia University, and author of Territory, Authority, Rights. – Edward Linenthal, author of The Unfinished Bombing: Oklahoma City in American Memory. Just after 9/11, Americans came together in a way not seen for generations. As people gave blood, enlisted in the army, and stickered their cars with the flag, they looked to Ground Zero as a rallying symbol, confident that its restoration would prove New York City — and the nation – was stronger than ever. But before rescue workers had even finished clearing the rubble, the site was embroiled in controversy that would plague it for the next ten years – and rob the country of the closure it so desperately sought. Elizabeth Greenspan has been documenting the events at Ground Zero since the fall of 2001, speaking with scores of neighborhood residents, rescue workers, and victims’ relatives, as well as attending key meetings where the site’s fate was decided. 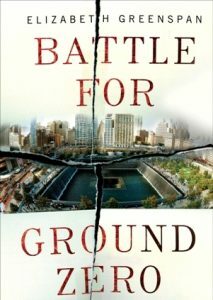 Battle for Ground Zero takes the reader behind the scenes to reveal how grieving families, commercial interests, and politicking bureaucrats have clashed at every turn – from security concerns to the design of the memorial to the role of office space in the rebuilding — confounding progress and infuriating the public. Drawing on unique interviews with key New York players like Governor George Pataki, über-developer Larry Silverstein, Port Authority director Christopher Ward, and master planner Daniel Libeskind, Greenspan provides an unprecedented look at this dysfunctional process, which so often mirrored the complex challenges of the times. One WTC may again be the tallest building in New York, but Americans will never forget how long it took to get there. 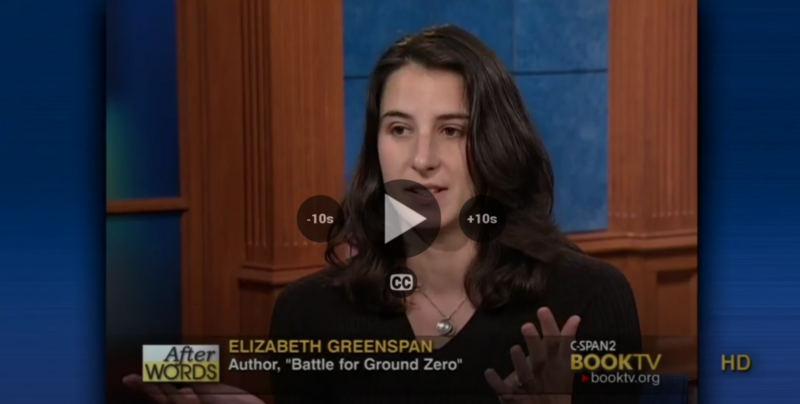 In Battle for Ground Zero, Liz Greenspan captures the intervening decade with vital, uncompromising clarity. “The Delicate Task of Memorializing the Boston Marathon Attacks,” New Yorker, April 18, 2017. “Top-Down, Bottom-Up Urban Design,” New Yorker, October 19, 2016. “Daniel Libeskind’s Secret Museum of the Kurds,” Bloomberg Businessweek, April 11, 2016. “Are Micro-Apartments a Good Solution to the Affordable Housing Crisis?,” New Yorker, March 2, 2016. “The New Must-Have for Luxury Buildings: Graffiti,” New Yorker, May 3, 2014. “A Whole Foods Grows in Brooklyn,” New Yorker, December 17, 2013. “How to Manhattanize a City,” New Yorker, October 24, 2013. “Daniel Libeskind’s World Trade Center Change of Heart,” New Yorker, August 29, 2013. “Denise Scott Brown’s Wayward Eye,” Architect Magazine, September 2018. “What the Aftermath of 9/11 Can Teach Us About Trump’s Border Wall,” The Washington Post, September 11, 2017. “Kim Stanley Robinson’s Sci-Fi New York,” Architect Magazine, May 2017. “The Ambitious But Flawed ‘House Housing,” Architect Magazine, September 2016. “On Pivoting: How We Talk About Labor,” Pacific Standard, November, 2015. “It’s a New Day in the Gayborhood,” New Yorker, August 8, 2014. Book Review: ‘Bricks and Mortals,’ by Tom Wilkinson, Boston Globe, July 22, 2014. “The Beginning of America’s Most Fought-Over Public Space,” Salon, August 18, 2013. “A Tradition of Conflict and Controversy at Ground Zero,” The Atlantic (on-line), September 10, 2010. Listen to Liz discuss the opening of the 9/11 Memorial Museum on PRI’s ‘The World. Liveblog about Battle for Ground Zero on Firedoglake. Sixteen Acre Battlefield,” Harvard Magazine. Q&A with the New York Times’ Michael Paulson.